The Austin Bantam Society| A Home for Austin and Bantam Owners and Enthusiasts! As I sat on the woven cane seat of the rustic wooden chair at the small, round table in La Madeleine Cafe waiting for Luis Martin, I was on a full voyage of nostalgia. Dr. Martin and I first met in the early 1990s when my company was under the leadership of a quirky visionary who had hired Luis to help us think differently about ourselves. Luis created what he called the Intellectual Fitness Center and maintained that if we would do mental workouts, our brains would be better off than if we just let them go flabby. Times were good in corporate America, and lots of companies had places for their employees to work out their bodies. Our company had a place to work out our minds. I liked Luis’ ideas. He helped me to think differently about myself. Luis’ lectures on philosophy and history are etched in my memory. And I even adopted a few (not enough) of his intellectual fitness practices. So on this day, as I was thinking about how we can help preserve the Bantam factory in Butler, PA, it’s only natural that I turned to Luis for some thoughts. Even my brain flab was excited about the conversation to come. Luis is an interesting character. 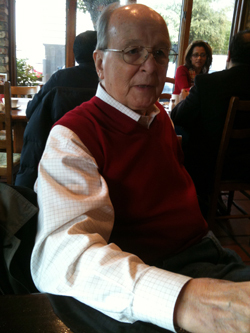 Now 83, he is a native of Seville, Spain. 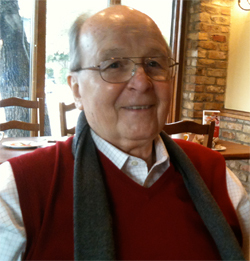 He received his undergraduate degree in Classical Studies from San Luis College, Puerto de Santa Maria, Cadiz, Spain, and earned a Master of Philosophy degree from Recuerdo College in Madrid in 1952. 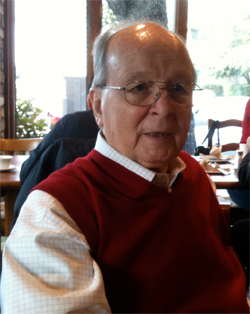 He received a Licentiate of Sacred Theology from Boston College in 1960, and a PhD in Latin American History from Columbia University in New York in 1966. Early in his career, he taught at Sophia University in Tokyo and then at the University of Puerto Rico before coming to Southern Methodist University (SMU) in Dallas some thirty years ago. Now a Professor Emeritus, he still offers a few classes at the University of Texas, Dallas, and continues to do executive seminars in the corporate world. He has served as a panelist on the National Endowment for the Humanities and was named to the Royal Order of Civic Merit by King Juan Carlos of Spain. 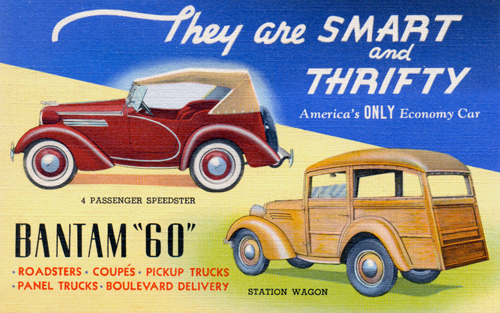 Bantam cars came in a variety of body styles, as recorded in this promotional post card from the 1939. I wanted to mention that Austin and Bantam cars wouldn’t hold four adults in the back, let alone a number of kids, but I knew that would be beside the point. So I asked him why old stuff was important. There were two objectives in my question. First, to help strengthen the argument for the preservation of the Bantam factory building; and second, to help us as a Club understand some of the underlying motivations in our hobby, so we can stay healthy and growing as an organization. About this time, a striking middle-aged blonde woman walked right up to Luis with her cup of French roast coffee in her hand and told him he was a fascinating man. She did not mention whether or not I was fascinating. Luis is a history rock star. When he talks about opening the window to our past, you can see the window and you can see it opening, and you can feel how important the link to our past is. He has a gift for teaching. He’ll be teaching until he can no longer speak. “I don’t think the ultimate satisfaction of your hobby is to sit alone in your garage caressing your car.” said Luis. I was about to confess to doing this, but I knew that would be beside the point. 4. What is it for? Sensing my concern about how I was going to talk about Aristotle here, Luis quickly brought the questions down to earth. So we talked about Lord Herbert Austin and how he defied his Board of Directors to create his little Austin Seven, getting the British working man off his motorcycle and into a car. And how the genius of this little car spawned derivatives around the world, including BMW, Jaguar, and American Austin and Bantam. We talked about Austin’s American heirs, convinced they had the right car at the right time, only to have the Depression, Henry Ford and American appetites show them otherwise. And we talked about the invention of the very first jeep. 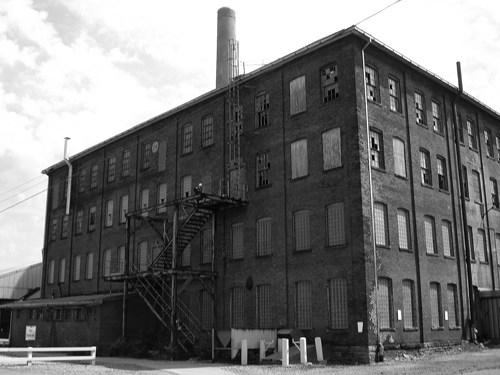 The former American Austin Car Company and Bantam Car Company factory in Butler, PA is the target of a restoration campaign spearheaded by the Butler County Tourism and Convention Bureau. Of course the dreams and achievements of the founders of the American Austin and Bantam car companies happened while some of us were children and many of us were not yet born. So, as I explained to Luis, with the boomer generation and the one before it, we have already been in the business of passing the heritage along. I knew what Luis was saying here. Another of his well-known Intellectual Fitness exercises is what he calls the “Shoe Exercise.” He invites his students to think about one of their shoes, turning over in their minds the origins of the shoe: the clerks at the shoe store, the truckers who brought the shoe from the factory, the workers who assembled the shoe, the purchasing agents who acquired the materials, the tanners who processed the leather, the ranchers who raised the cattle, the farmers who grew the feed for the cattle and on and on. I began to think of the story we uncovered last year about Virta Warrens, the Bantam dealer in Portland, Oregon. Now there’s where one thread led to another, and another and another. First we found Virta’s nephew...then her daughter Sue Tucker, then her grandchildren and great-grandchildren. We learned about Virta’s racing career and her belief in the virtues of the American Bantam automobile. We watched film of her daredevil driving down hillsides and up staircases. Imagine if we pulled threads on every Austin and Bantam dealer in every city in the country. Then I thought about the photo we published last year of the Bantam factory workers. Through all our efforts so far, fewer than half of those faces have been identified. Yet every single person in that photo had a name. More threads to be pulled. How many threads are there in the story of Bantam factory building? How many dreams? How many ideas, inventions, achievements? Every worker who set foot in the place over more than a decade had hopes, dreams, achievements and disappointments. Most had children and grandchildren. Who are they? Where are they now? What happened in that building besides the creation of the American version of one of the most influential automobile designs in history? And the invention of the vehicle that would change ground warfare forever? Whose resourcefulness brought solutions to issues of funding, design, engineering and supply? What arguments took place, what manipulations, what survival maneuvers? How many tears were shed, what fortunes gained and lost? What friendships were formed or destroyed? Whose trust was earned or betrayed? More and more threads. If each old car is a window to our past, this factory where all the cars were made must be a vast picture window. First in line peering into this large window are the good people of Butler, Pennsylvania. It is their parents, in-laws, grandparents and great-grandparents who toiled here, who brought home the bacon for a time here. The folks in Butler, or at least many of the folks in Butler, recognize the value of the building’s preservation. But we are all linked, too, through our cars and through our interest in where they came from and who made them, to the preservation of this important window to the past. So spend a few minutes now thinking about your favorite Austin or Bantam. Trace its history in your mind. Imagine its early owners, even if you don’t know their names. Picture it being made in the stout brick factory building that still stands, for now, in Butler...workers entering the building and punching in, taking their places along the assembly line, and building cars that would outlive them and us. You can visit that plant in your mind as many times as you like. And if we all put our minds to it, we may find a way to preserve it, so we all can some day walk into it, touch its walls and look through its windows into our past.